The intensity and size of forest fires ranging in Russia threaten a repeat of the catastrophe of 2010. The Siberian wildfires of 2012 may turn out to be even worse than a similar round two years ago, warn Greenpeace experts who are monitoring the situation. 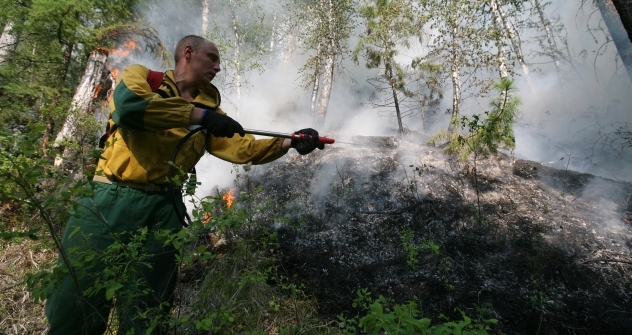 According to the Russian Forestry Ministry, the total area of land affected by fire in 2010 was over 1.2 million hectares; official figures for this year are not yet available, but even preliminary estimates for the end of July 2012 are alarming. The government fire-fighting agencies have yet to declare the total damage caused by fires, but they have adopted a less-tragic view of the situation. In its daily reports, the Emergency Situations Ministry has said that 23,000 hectares affected; the Forestry Ministry says 18,000 hectares are on fire. The striking difference in the figures has already prompted criticism on the part of environmentalists. Greenpeace’s Kuksin has accused the Emergencies Ministry of simply hiding the true scale of the disaster. “The ministries responsible use satellite pictures, just like we do, but they prefer to hush up the real state of affairs,” Kuksin said. Even so, the situation is different from that in 2010. Two years ago, fires swept across virtually the entire territory of Russia, including its European part. Now the fire is threatening mainly Siberia, as confirmed by the interactive map of forest fires cited by Greenpeace. Central Siberia is the hardest hit. The Tomsk Region, the Krasnoyarsk Territory and the Republic of Tuva have declared a state of emergency. As of July 31, there were 123 pockets of wildfire in the region, and firemen have so far been unable to bring the situation under control. They put out 46 flash points over the past few days, but 35 new ones have appeared in the Siberian forests. Smoke from the fires has paralyzed air transport for several days and has reached dangerous concentrations in major Siberian cities. Related: Russia may fight fires in the U.S. The smoke has even affected the west coast of the United States – scientists say that the intense heat from the fires has pushed the smoke 12 miles into the air, where it is carried by winds across the Pacific into the upper atmosphere. The increased particles in the air have produced especially red sunsets in California, Oregon and Washington state. The Defense Ministry has also joined the efforts of the firemen and rescue workers. A total of 113,000 people, 17,000 vehicles and 37 aircraft are engaged in putting out the fires, according to the Emergencies Ministry. At least 7,600 people are working in actual hotbeds of the fire. Experts cannot predict how soon the rescue workers, military and volunteers will be able to cope with the fire, but Greenpeace is pessimistic. “At the stage when something could have been done with the available resources, the fires were hushed up. Yet it was at that stage that a state of emergency should have been introduced and reserves brought in to keep the situation under control,” Kuksin said. Can the Russian government force homeowners to protect their properties? The Emergencies Ministry, on the contrary, is sure that the fire services will prevent a repeat of the scenario from two years ago. Ministry representatives stress that, in spite of the large area of fires, there is no threat to communities and industrial facilities. This article was compiled from reporting by RIA Novosti, Lenta.ru, the Geo magazine, Argumenty I Facty and press releases from the Emergency Situations Ministry and Forestry Ministry.